February 28, 2010 - On Friday, United States District Court Judge Rosemary M. Collyer ruled that a list (Blocked List) of private aircraft, whose aircraft tail numbers are blocked from the public view must be released under the Freedom of Information Act (see court report). The National Business Aviation Association sued the Federal Aviation Administration (FAA) in order to prevent the FAA from releasing a blocked list of aircraft registration numbers to ProPublica, Inc.
ProPublica is an independent, nonprofit organization that produces investigative journalism in the public interest. The National Business Aviation Association (NBAA) represents more than 8,000 companies of all sizes throughout the United States. Anyone can go to the FAA internet website and look up an aircraft registration, "Tail Number" number to gain the knowledge of the owner of any aircraft. 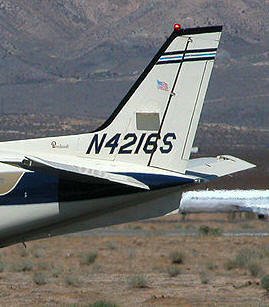 However, there are a select few who wish to keep their aircraft tail numbers anonymous, such as corporations. A long standing practice allowed companies to add their aircraft to a list that prevented anyone from learning the aircraft owner. NBAA argued that the "Block List" provided privacy to the owner and anyone traveling on a blocked list aircraft. It also prevented disclosure of business trips that could affect stock prices or give competitors an edge about potential deals. On November 19, 2008, the Big Three auto companies were before the House Financial Services Committee asking congress for bailout money. "There is a delicious irony in seeing private luxury jets flying into Washington, D.C., and people coming off of them with tin cups in their hand, saying that they're going to be trimming down and streamlining their businesses," Rep. Gary Ackerman, of New York, told the chief executive officers of Ford, Chrysler and General Motors at the hearing. Lawmakers and the news media lashed out at the CEO’s of the Big Three auto companies for going Washington in luxury and asking for tax payer dollars. Although the public at that time was not able gain access to the FAA "Blocked List" anyone could go on the internet and track any aircraft in real time. General Motors (GM) learning that their aircraft were being tracked, sought to have its planes blocked from tracking. As a result, in December 2008, ProPublica publications sought the list of aircraft owners on the FAA Blocked List in December 2008, under the Freedom Of Information Act. NBAA then filed a lawsuit in an effort to prevent the FAA from releasing the list. “The BARR Program was established over a decade ago in response to recognized security concerns and competitive considerations. The program, which allows NBAA Members’ flight information to be concealed from release outside the FAA, came under challenge in December 2008 when an investigative-journalism organization filed a Freedom Of Information Act (FOIA) request with the FAA seeking the tail numbers for aircraft which had been submitted to the FAA for blockage from public view”. “Working with legal counsel, NBAA aggressively defended the confidentiality of the blocked tail numbers by filing an action with the District Court seeking a reversal of FAA’s determination to grant the FOIA request. After considering the matter for several months, on February 26, 2010, the court declined to overrule the FAA’s decision to release the blocked tail numbers. The court’s ruling does not impact real-time or historical data on BARR-concealed flights”. “Lamond noted that although NBAA is unaware of what, if anything, the investigative-journalism organization intends to do with the information obtained through its FOIA request, operators with aircraft tail numbers included in the FAA Block List might be contacted by the news organization. In that event, NBAA is prepared to assist Members in responding to such inquiries”.